Nobody even vaguely familiar with the Guardian Group’s animosity towards Israel’s prime minister would be surprised that they’ve taken editorial stances in favor of Binyamin Netanyahu’s major opponent, Isaac (Boujie) Herzog. The only recent surprise is that the Guardian Group’s so-called more moderate brand (The Observer) published an official editorial on March 15th even more one-sided, hyperbolic and misleading than one which appeared in The Guardian a few days earlier. 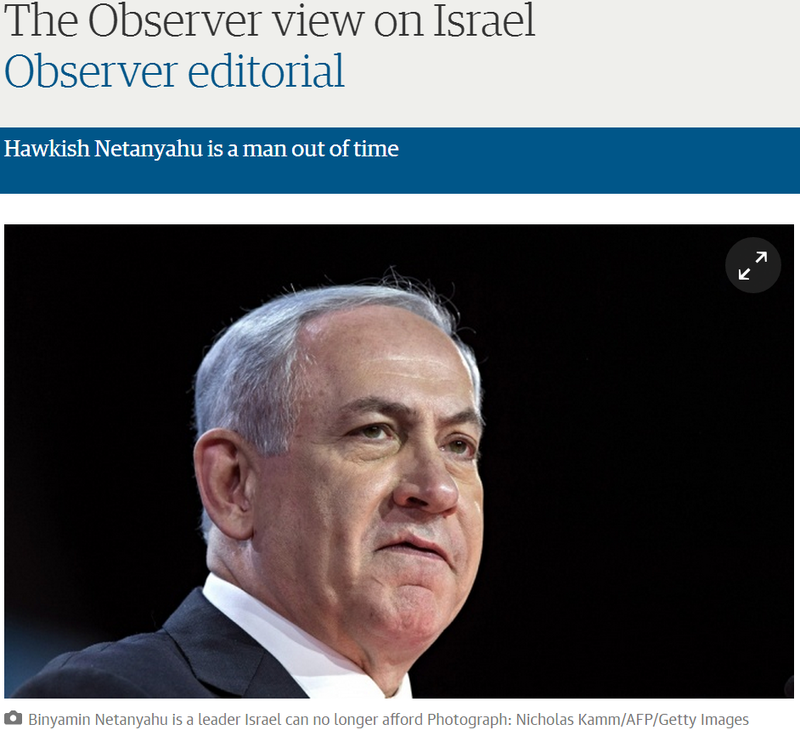 The Observer editorial begins by casting Netanyahu as “Mr. No”. On a nuclear deal with Iran, Netanyahu’s response is a very Gaullist “Non”. On the question of a wider western rapprochement with Tehran, he grimly says no, too. On resumed peace talks with the Palestinians, or a freeze on Jewish settlements in the Occupied Territories, his answers, once again, are bluntly negative. First, if Observer editors had decided to read the transcript of Netanyahu’s speech before Congress, they would have seen that – consistent with his statements over many years – he is not rejecting a nuclear deal with Iran, only a bad deal, one which could allow the Islamist regime to be merely weeks away from a bomb. Further, Netanyahu isn’t against “rapprochement”. Rather, he believes that, before lifting restrictions, the world should demand that Iran stop exporting terror around the globe, and cease threatening to annihilate the Jewish state. The Observer’s final claim, that Netanyahu has said ‘no’ to peace talks, is categorically untrue. Since taking office, he has agreed to talk to Mahmoud Abbas without pre-conditions. Indeed, it was Abbas who consistently said no to the resumption of negotiations and continually issued new demands, such as a moratorium on settlement construction and the release of hundreds of convicted Palestinian terrorists, to even talk about peace. In defiance of his own intelligence chiefs, he appears to believe he alone appreciates the true extent of the dangers Israel faces. In fact, Netanyahu is not standing alone at all. As even The Observer alludes to further in the editorial, there is an Israeli consensus on the Iranian nuclear issue, with polls showing that an overwhelming majority of Israelis believe that a nuclear armed Iran represents an existential threat to the country. These same polls also indicate that most Israelis are skeptical that US negotiations will prevent Iran from getting the bomb. In a subsequent passage, The Observer again shows that their prejudice is subservient to any pretense of providing a fair and honest assessment of the recent history of Israeli-Palestinian negotiations. The collapse last year of painstaking US efforts to revive the peace process between Israel and the Palestinian Authority was blamed on Netanyahu’s intransigence. However, their own Jerusalem correspondent, Peter Beaumont, implicitly admitted that this isn’t true and that, at the very least, both sides were to blame. In an April 29th article published in the Guardian, Beaumont acknowledged that talks broke down in part because Abbas refused to agree to continue talks past the April 29th deadline; he reneged on his pledge not to engage in “unilateral moves to join international bodies and treaties”; and due to Fatah’s reconciliation with the terror group Hamas. Netanyahu, seeing enemies everywhere, viewed the Arab spring revolts as an Islamist conspiracy, rather than an exceptional opportunity to spread democracy across the Arab world. Beyond appeasing their usual radical left consistency, it’s far from clear who editors at the Guardian and Observer seek to influence in taking such bellicose stances against the Israeli leader. To even Israelis on the left end of the political spectrum, save the marginal few who are loyal to Haaretz, the Guardian’s outsized role in delegitimizing the Jewish state is well-known, and their editorial leanings completely irrelevant to their political considerations. Further, polls demonstrating that British Jews overwhelmingly believe UK media coverage of Israel fuels antisemitism, in conjunction with other polls indicating that Bibi remains quite popular amongst British Jews, would suggest that, to most within this small and increasingly beleaguered Jewish community, the Guardian is outright hostile to their interests. On Israel and other issues of grave concern to Jews, it is the Guardian Group which is dangerously “out of touch”. Towards the prime minister?! The Guardian worldview require to hate Israel, to hate every Israelis irrespective of their government function. (with the exception of those Israelis who themselves hate the idea of a democratic Jewish state). I don’t see any reference to the North African Jewish refugees of 1948-67. There were far more of them than the Palestinians and they lost far more land and other assets, Most are now the largest segment of Jewry in Israel. They have been making remarkable success catching up with their Ashkenazi brothers without UNRWA or camps. The Palestinian lives have been wasted and embittered by the Arab League’s insistence that no League member give the Palestinians citizenship. What the League can’t achieve with their defeated armies, they are achieving through propaganda to naive and gullible liberals. “There were far more of them than the Palestinians” – if only because there is no such thing as ‘Palestinians’. Some people seem to think that by marking me down they will make this mythical entity become more real. He really should watch his language, eh?! Well, Miranda found a burning fire, at least. Thtoughout the 19th century and almost till WWII Jews living in the Ottoman sanjaks, eyalats and vilayets of Acre, jerusalem, Syria, Gaza, Safed etc. and the latter Briitsh mandate in were denominated as Palestinians by the Europeans. One main reason why the British mandate was called that of Palestine. Therefore Jewish institutions in the British mandate often bore the term ‘Palestinian’. The name Palestine as administrative term of a province was introduced by the Romans in order to extinguish the memory of Judaea. The same can be applied when the Arabs of the British mandate formerly adherent of Greater Syria, Jordan or Egypt (or Great Arabia) politically adopted the name Palestinians after the foundation of Israel. Only a small group of Arab intellectuals already harboured the idea of a Arab Palestine in the thirties, they were without any relevance at that time. When the terms Palestine and Palestinian were relinquished by Israel and the Israelis, the defeat of Syria, Egypt, Lebanon etc. in 1948 nationalism as was nurtured by Egypt and Syria against the Jordanian annexation of Westjordanland and Israel as whole. So many terror groups (fedayin) mushroomed under the pretext of Palestine beginning in the 1950s. No need to thank for the lecture. Although it is given for nothing, it will be for nothing given your self hate. last I heard , the Goonadian doesn’t have a vote in Israeli elections and only about 4 peeps read the Goonadian over there [ adam levick included ] . So their endorsement of anyone means squat . Waste of print basically . A day when they don’t pour buckets of hatred over Jews – THAT is a waste, in their psychotic universe. By the way: the Observer stopped being more ‘moderate’ long ago. It’s an equally antisemitic cage-liner and has been for yonks. Did they really think that those who see Israel as an important issue, whether for or against, do not know what the Guardian/Observer “view” of Israel is? They love piling it on. Its their obsession. I cannot wait to see who the Guardian will be backing for the PA elections. PA elections? You may have to wait a very long time for that news story and editorial! New ‘Hate Bibi’ Guardian thread. So where is all that democracy, I mean aside from Israel, the country these guys keep telling readers they should hate? Maybe I am simply obtuse but does the Guardian weighing in on Israeli elections mean we can weigh in on all UK election issues? Now that would be fun from Scottish independence, to the usefulness of the NHS and of course whether they should just do away with the Labor party altogether and go back to the way the UK behaved under Churchill and hope for a new Thatcher. The Guardian will do better to report on what Vladimir Putin has just done… Here’s your clue… ‘DEAD HAND PROCEDURE’…..